For a comprehensive, printable selection of days out by train, please visit Day Trips on the Cornish Main Line or for train times visit our Transport page. Come to Totnes for independent shops, handmade shoes, vibrant cafes serving a range of ethical and home made food and drink. Totnes Castle - is one of the best surviving examples of a Norman mote and bailey castle and has commanding views of Totnes, the river Dart and the surrounding countryside. The footpath to the town centre from the station takes you past the castle entrance. South Devon Steam Railway - (01364 642338) is a short walk from Totnes station - follow the signs from the down side station building. On average between April and October there are 3 trains each way between Buckfastleigh and Totnes. (Trains may not run every day - check the timetable first.) The journey time is 25 minutes. 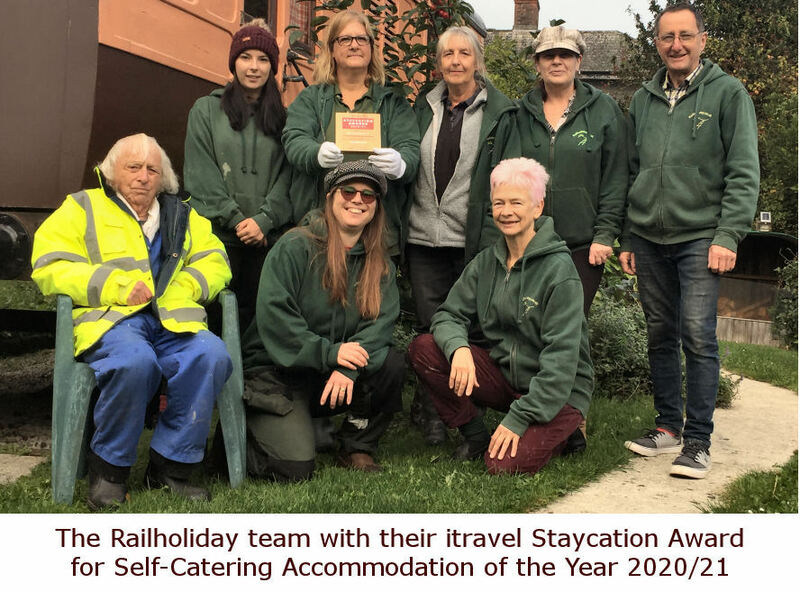 Worth checking out on route is Staverton (10 minutes from Totnes), an idyllic country station with river and woodland walks. The village with its 14th century church and village inn is about twenty minutes walk from the station. At Buckfastleigh there is a Butterfly Garden & Otter Sanctuary and a combined ticket is available for the train and attractions. 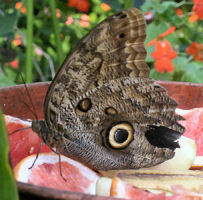 The Butterfly Garden has exotic butterflies and moths from around the world free flying in a tropical landscaped garden where birds, fish and terrapins can also be found. 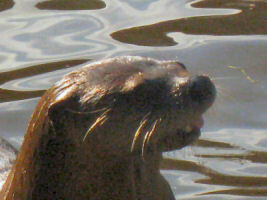 There are three different species of otter alongside the native British otter in the sanctuary. In July & August a vintage bus ferries train passengers from Buckfastleigh station to Buckfast Abbey. Again, a combined train & bus ticket is available. It is also possible to catch a bus to Dartmouth from Totnes, taking a ride through steep rolling red hills. 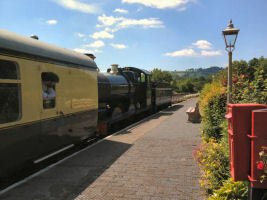 Dartmouth is the destination for the Paignton steam railway, and from here you can catch a boat and steam train back to Paignton and then jump on the branchline to Newton Abbot. Calstock is a pretty village sitting upon the river Tamar with picturesque views of the railway viaduct. Traditionally a mining area, this little village is now somewhat a hub for the arts, as well as being in the centre of a market garden area. Often events happen here, from poetry readings to harp recitals, drumming workshops and rock concerts. The two main arts venues are Calstock Arts a beautifully converted chapel with fine views over the river and Calstock Hall an active community centre. Calstock also has a fine pub The Tamar Inn selling real ales and great food, an icecream parlour and the Lime Kiln Art Gallery. Take the train to the end of the branch line at Gunnislake, stay on it and return to Calstock for your day out, as the line between Calstock and Gunnislake runs through deep mining valleys and is very picturesque. 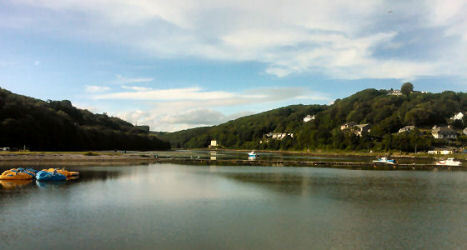 The station at Gunnislake is high above the village and there is more to see in Calstock. Cotehele House is very historic, dating back to the medieval times. It has had very few alterations and still contains original armour, tapestries and furniture from this period. The gardens are beautifully landscaped with a splendid dovecote, terraces and pools. There is a restaurant and a shop alongside the house. A short walk from the house is a working water mill, lime kilns, a restored Tamar sailing barge, a shop selling quality pottery and art, a tea room and in the summer a stall selling ice creams. Because there is no electric lighting Cotehele House closes at dusk in the spring and autumn. Cothele has recently established a new apple orchard, well worth visiting in spring and autumn. One of the highlights of the Cothele calendar is the November garland making, the late November food festival and the December Christmas festivities, with the hall hung with the beautiful flower garland and live music every day. 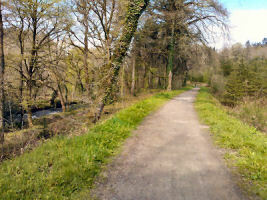 To walk to Cotehele from the Calstock station take the footpath to the road and head downwards. Go past the chapel that has been beautifully converted into the Calstock Arts> venue and take the first right turning. This lane leads first above, then later alongside, the river. It is worthwhile looking to your right to view the other side of the converted chapel with its huge glass facade. As you continue along this lane you will notice on the right the grounded body of a GWR coach, built in Swindon in the 1890s. The road passes under an old incline bridge and past a small boat yard. After a large house with distinctive balconies on the right the road veers to the right. Take the lane that leads off to the left on the bend, past a small terrace of houses. One of these houses is the home of a potter who sells her beautiful blue glaze ware from a small hut at the beginning of the terrace. After the terrace the path splits, take the left hand path, skirting upwards through the woodland with the river always just to the left. At the top of the hill the path levels and you can take a right turning signed to Cotehele but first continueg along this path to the stunning view point and the tiny Renaissance chapel. The chapel, tucked on the outskirts of the woodland and overlooking the river, was erected in the fifteenth century to celebrate the lucky escape of Richard Edgecumbe from the roundheads during the civil war. Being pursued by a whole troop of men, Richard Edgecumbe threw his hat and a stone into the river below, fooling his pursuers into thinking he had fallen in and drowned, and thus escaping a fairly certain death. The chapel was put up on the spot where he had been hiding. Continue along this lane and another turning on the right will take you through Cotehele gardens and towards Cotehele House. However if you stay on this pleasant and wide walkway you will reach the quay with all its attractions; coffee shop, art gallery, lime kilns, sailing barge, ice creams and mill. Here once again Cotehele is clearly marked up the short hill, and this is the route I would recommend. It is possible to turn this walk into a longer circular walk with the aid of an OS map and a leaflet that can be picked up in the art gallery detailing walks of the area. However, for the purpose of this trip I suggest returning the same way as you came, but going through the gardens to pick up the original path. Turn left, descend the steep hill, right at the bottom and past the terrace of houses, straight on at the metalled road and back to Calstock. However rather than returning up the hill to the train station it is worth going down to the quay and having a look around Calstock, perhaps making use of the riverside cafe that serves cream teas, or the pleasant riverside pub. At the end of the Looe Valley branch line, Looe is well worth a visit. It is a typical coastal resort with a pretty working harbour offering fishing trips, a pleasant beach, excellent fish and chip shops, and plenty of other shops, restaurants and a couple of amusement arcades. The Cornwall and Devon Rail Partnership often run events on the Looe Valley line. Sit on the left of the train as you leave Liskeard to fully enjoy the splendid vistas as the railway skirts along the lovely Looe estuary, a haven for wildlife and birds. Little Egrets, herons, kingfishers and oyster catchers can be seen enjoying the mud banks created by the low tide. Shop - Looe is great for touristy and quirky gifts, and there are plenty of cafes, restaurants and pubs offering a range of food, with an emphasis on fish, the town's main trade. There is a good bookshop specialising in antiquarian books and several clothes shops. Enjoy the beach - Looe has a good sandy beach with step free access and toilets and cafes to hand. Sea fishing and boat trips - Looe’s working harbour runs parallel with the main street, to the right hand side of the road. 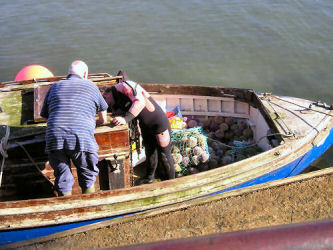 Here you can see the fish market, or nearer the beach end book fishing trips on a variety of boats. Sea fishing options usually include searching for mackerel, sharks, deep sea fishing, or just pleasure trips. 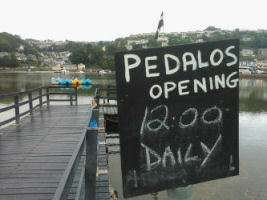 There are plenty of short trips out around the harbour or around Looe island. Woodland Walks - Kilminorth Woods across the river from the station is open to the public and accessible through a series of paths. 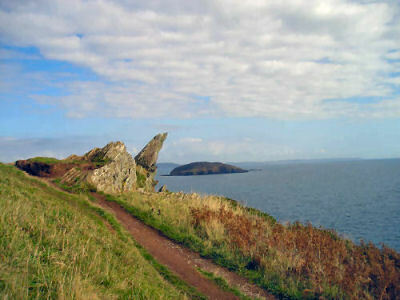 Walk to Polperro along the coast path - An enjoyable walk can be made by crossing the bridge into West Looe, then turning left and keeping the river close on your left. 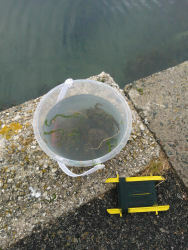 This will lead you onto a footpath which later rejoins the road towards Hannafore Point where there are some good rock pools. 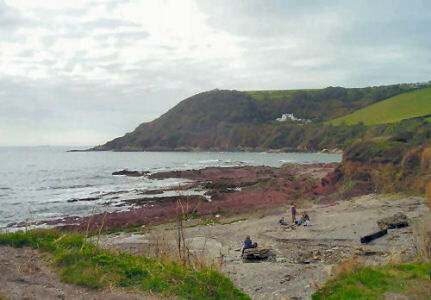 Continue to the end of the road and then follow the coastal footpath to Talland Bay, a pleasant bay with sand, rock pools and a pleasant little beach cafe. The footpath continues to Polperro, a very pretty, understandably touristy village with lots of smugglers’ cottages, narrow streets and tiny doorways. It is about three miles from Looe to Talland, and a further mile to Polperro, so with a stop at the beach and a look around Polperro this is a day trip in its own right. There is a bus service between Looe and Polperro so it can be a one way walk. Polperro Model Village - including a OO gauge model railway. The Polperro Harbourside Museum - a very pleasant little museum with plenty of local history and some up to date information on among other things smuggling, knitting, pilchard fishing and manufacture. Blue Peter - a true local pub serving excellent home cooked food and real ales, with live music from time to time. 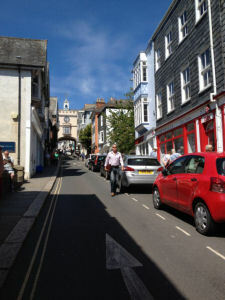 Take a look at Looe on our Railholiday Pintrest page. 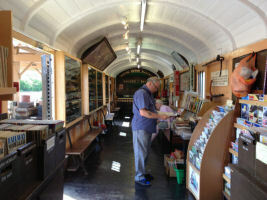 The Bodmin and Wenford Railway is a pleasant steam excursion on a steep gradient line taking in some interesting Cornish countryside on its route, and has a very good gift shop at Bodmin General. From the downside platform cross the footbridge and the steam platform is the one facing away from the mainline. Once on the railway there are several things to do on the way. 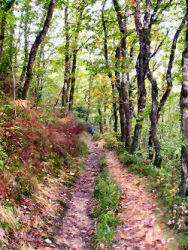 At Colesloggett halt a footpath with stiles (muddy in wet weather), leads to Cardinham woods where there are nature trails, mountain bike tracks (Cycle Hire)and refreshments in the woodland cafe. At Bodmin General there is a gift shop and cafe, and from here you can catch a train to Boscarne junction which is the start of the Camel Trail cycle path. 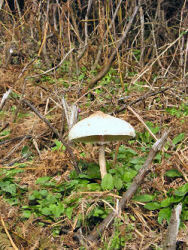 A ten minute along the trail will take you to the Borough Arms. To get to Bodmin town, turn out of the station and walk down the hill. In Bodmin there are plenty of places to shop and there is a fish and chip shop at the bottom of the town. Among the attractions in Bodmin is Bodmin Jail, a theme museum for families. This is a former county prison dating back to 1776. The exhibition includes a visit to the dungeons with a historical display of crime and punishment. There is a family play room, shop, tea room and licensed bar. 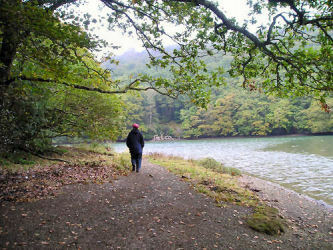 Back at Bodmin Parkway a pleasant two mile walk along the old carriage drive will take you to Lanhydrock House. Go through the burgundy gate at the station car park entrance and follow the lane to its end, beside a lodge house. Go straight across the cross roads, past another lodge house and continue along the tree lined avenue to Lanhydrock House. At the first Lodge House a pleasant diversion can be made by turning left to the bridge which offers good views over the railway, and then taking the clearly marked river walk. There is often an ice cream van in the car park here during the summer months! Lanhydrock House is one of Cornwall’s grandest houses, and is set in beautiful gardens and woodlands overlooking the valley of the river Fowey. It has a restaurant, shop and toilets, and the interior of the house is well worth a visit, if only to look at the fascination sculptured ceiling and walls of the great hall. The house has been used for several costume dramas. 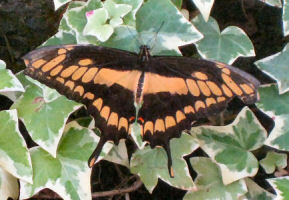 The park is open all year round and extends to nearly 1000 acres.